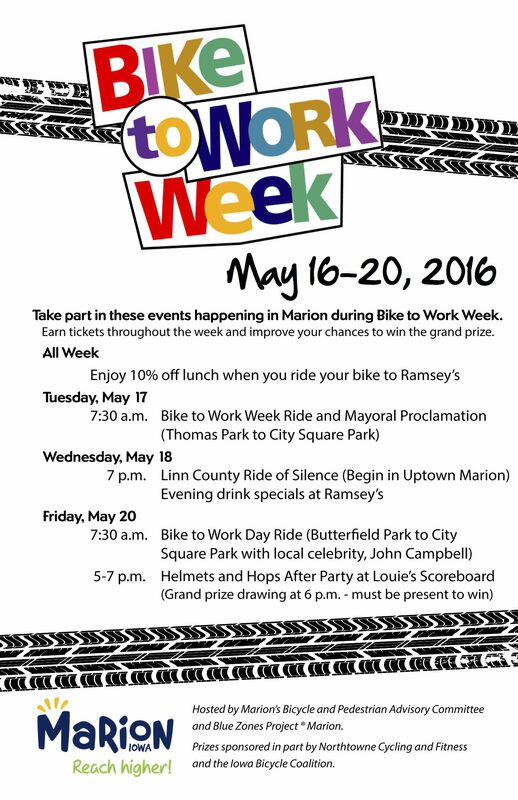 Cyclists are encouraged to ride to the Marion Uptown Farmer’s Market on Saturday June 13th for a chance to win $25 in Uptown Bucks for use at Uptown Marion businesses. The Farmer’s Market will be held at City Square Park from 8:00am to noon on Saturday June 13th. The first LCTA Board meeting of 2015 will be held on Monday, January 12th, at 7:00PM at the Shores Event Center. We will have a guest presentation from Jon Bogert from Anderson Bogert Engineers & Surveyors to discuss East Side Flood Mitigation plans and designs. Please see the attached agenda for the full details of the meeting. Our meetings are always open to the public and new faces are always welcome. 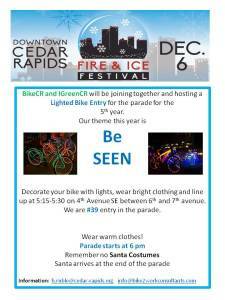 Most of you have heard that Cedar Rapids has been named a Blue Zones community, and we all know that cycling is an important part of a healthy lifestyle. On Monday, Sept 9, you have an opportunity to demonstrate your support of bicycling’s role in a healthy community by participating in a group that will go to the Blue Zones Kickoff event by bicycle. Nikki Northrop Davidson, from the Bicycle Advisory Committee and Bike2WorkConsultants will be leading the ride. Destination: Prairie High School, College Community Concert Hall, 76th Ave SW.
To participate, meet at Green Square Park in downtown Cedar Rapids at 5 pm on Monday, Sept 9th. You must wear a helmet and you should have lights on your bike (it is likely to be dark by the time the event is over). This will be about a 9 mile ride each way, most on the trail but some on streets. I anticipate arriving shortly before 6 pm at the event. No registration is required for the ride. Looking forward to leading a group of cyclists who demonstrate they are living healthy by cycling to this event! 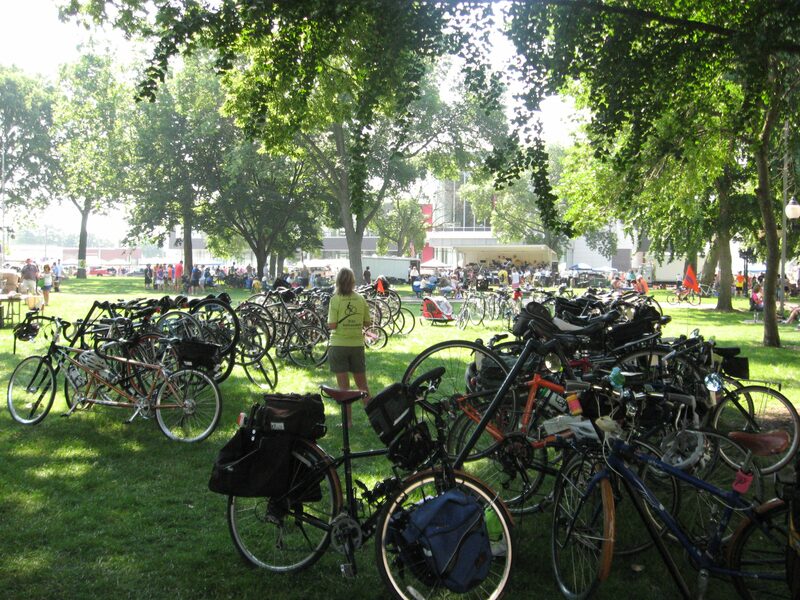 Thank you to all of those who used the Downtown Farmers’ Market Bicycle Corral on Saturday. We had the best turn out ever! At one time, we had over just over 100 cyclists use the service. This is a great demonstration of our community’s commitment in selecting cycling as an alternate means of transportation to and from the market. In addition, it illustrates support and usage of trails and other on-street bicycle facilities as important elements in commuting around the area. The next market is July 20th, with August 3rd designated as “Bike to the Market Day” so there are several more opportunities to use the service if you haven’t already. Special thanks to Saturday’s volunteers who assisted with the parking. If you would like to help, anyone can sign-up at http://www.signupgenius.com/go/70A0E4DAEAC2EA64-farmers. Thanks again for everyone’s support and help! Saturday, May 18 is looking to be a wonderful spring day! Take advantage of the great weather by volunteering with LAMBA! 7-9 am: We will start the morning at Squaw Creek Park in Marion by helping Linn County Conservation load trees for Operation ReLeaf. 9-10 am: Potluck style breakfast at tables near the upper playground. Bring something to share and socialize. Learn about the new trail. 10-? : Spend as much time as you like participating in Rake and Ride! This is the first event of its kind and it will be a great way to learn about the trail building process! Bring a lawn rake and gloves and of course, your bike. We will be raking the flagged trail corridor and then riding to try out different lines within the trail corridor. Please email me at [email protected] if you plan to attend! La Porte City, IA -The City of La Porte City along with the Black Hawk County Conservation Board will be hosting the Grand Opening Ceremony for the McFarlane Bridge on the Cedar Valley Nature Trail. The trail sustained heavy damage due to the floods of 2008 causing sections of the Cedar Valley Nature Trail to close until repairs could be made. With the opening of the Evansdale Bridge in 2011 and now the McFarlane Bridge opening in 2013, the Cedar Valley Nature Trail will again connect communities along its entire 52 mile corridor. Come and enjoy the “Bridge-2-Bridge” celebration with us. The ceremony will be held on Saturday, May 4th at the trailhead near the entrance of McFarlane Park located at 13619 King Road, La Porte City. The celebration will begin at 11:00am with music by “The Ramblers” and the La Porte City Fire Rescue crew will be serving up lunch for a nominal fee. The ribbon cutting ceremony will begin at 1:00pm. Guests are encouraged to bike to the event. Area bike clubs are organizing a large ride to the event beginning at Gateway Park in Cedar Falls. To get more information or to join their ride visit www.cvbikecolletive.org or www.CedarValleyCyclists.org. Otherwise, jump on the trail at any entry point between Evansdale and Hiawatha and make your way toward the dedication. The Cedar Valley Nature Trail is a segment of the American Discovery Trail and is one of the country’s oldest rail trails. 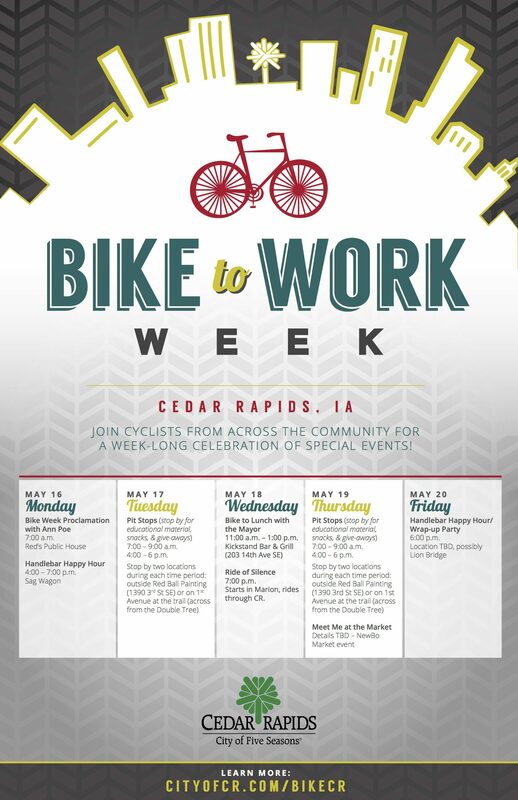 This trail is a vital part of the Cedar Valley’s recreational infrastructure and links the Cedar Valley to communities south to Cedar Rapids.